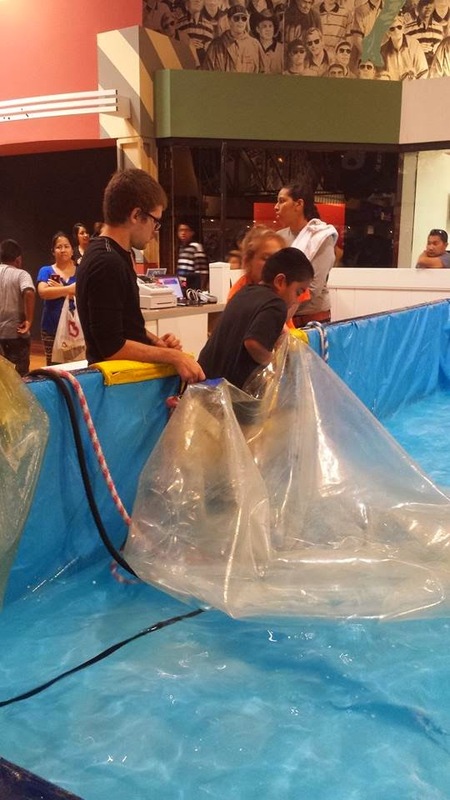 I went to Grapevine Mills Mall the other day and saw these kids in a plastic bubble trying to move on water. I thought, what the heck? So the sis and I stopped to watch and laugh at the boys (there were no girls trying it while we stood there). There was not one boy who could stand up and run. 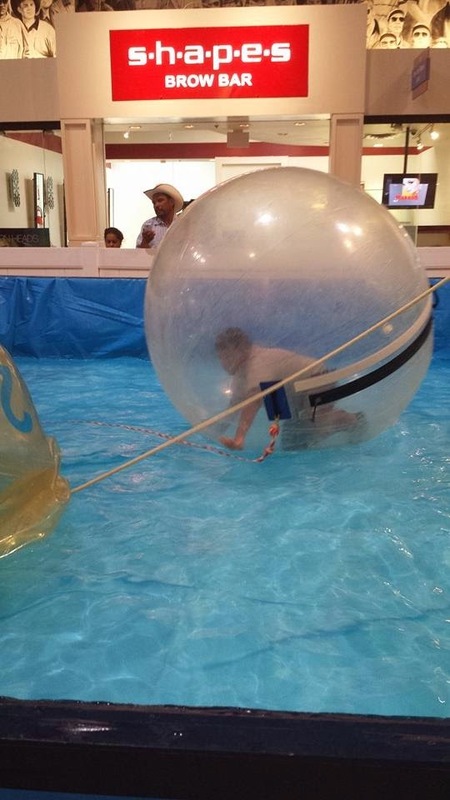 All of them were moving on the water by crawling inside their bubble. It was a hoot! When their time was up, the attendants would reel them in with the attached rope. There was only room for 3 bubbles on the make shift pool and the pool itself was shallow. It seemed a child could stand it would not even be hip deep on them. Maybe up to my knees if I was to judge it. An attendant would unzip the bubble, which allowed the air inside to escape thus deflating the bubble. 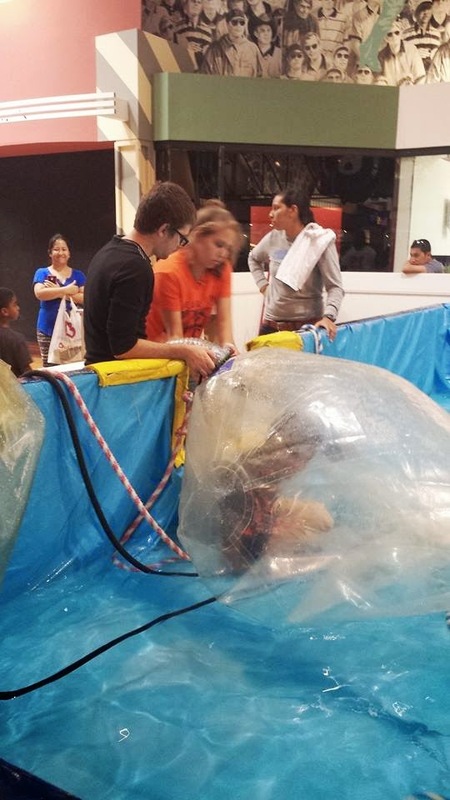 The person inside the bubble would climb out and in went another kiddo who would sit down, almost laying inside the bubble. The attendant would zip up the bubble and then attach a huge hose where they would inset air inside the bubble thus "blowing" the bubble up. From there is was a free for all on how to move to the other side of the pool. Here are my thoughts about this….thing. I couldn't do it. Too claustrophobic for me. I know you can see out, but you are still enclosed and can not get out whenever you like. You are dependent on someone else and when they are ready for you to stop. Plus you can't stand up. You have no balance. I think I am too much of a control freak to give up that much control to someone else. Second and just as important…germs. Now, I am not a germ-a-phobe, but all those kids, people breathing in the air and getting their germs on the plastic walls. Then for me to go in and breath some of their leftover air and touch the plastic where their grubby paws touched. No thank you. I would rather be breathing airplane air. At least I will be going somewhere cool and exciting, not just spinning in a plastic bubble like a rat! So that is my thoughts. I think it is great for kids who don't already have fears, phobias and wackiness already in their makeup (like me!). They are more daring and have a "who gives a flip" attitude. Ahhhh to be young again. So my question to you is…would you try this?